Conference@Oxford Saïd has achieved numerous accreditations, which all adhere to a set of stringent Quality Standards as well as agreeing to a Code of Ethics. With a vast amount of experience in conferencing and events, when you book with Conference@OxfordSaïd you will be in safe hands. 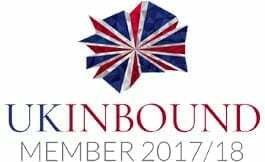 Our professional and dedicated team are here to help you arrange the perfect event from a variety of residential and non-residential options for up to 300 delegates. The team is committed to ensure the success of your event and will offer advice and support from initial enquiry through to planning, delivery and post-event evaluation. Our aim is to work in partnership with every client to offer a truly personalised service. 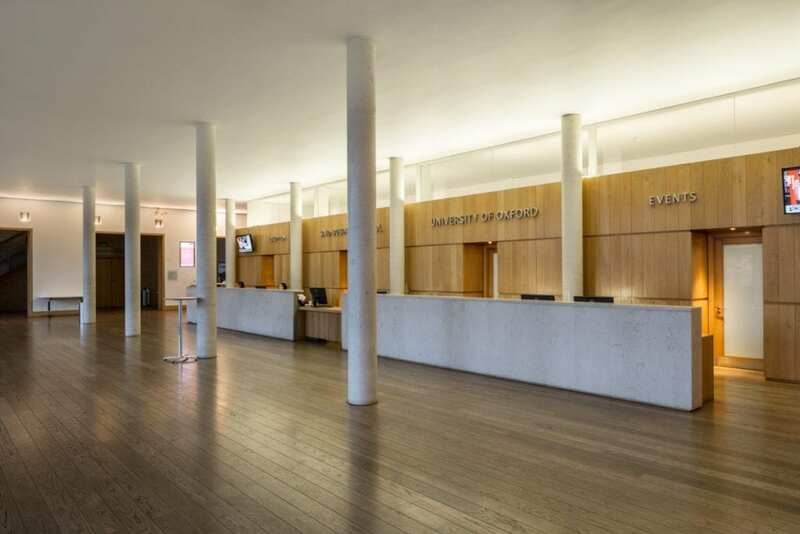 The impressive West Wing opened in 2012 and offers a wide variety of conference, meeting and exhibition facilities, finished and furnished to the highest of standards and with stunning architecture. The impressive entrance hall can be used for registration purposes. From there delegates can await their conference/event networking in the beautiful Club Room. 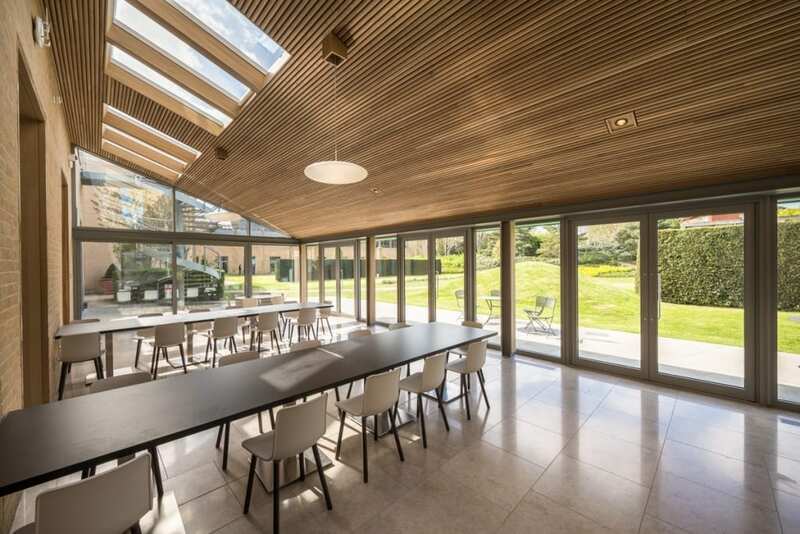 At the heart of the West Wing is the Club Room with a bar, lounge space, terrace and views across private gardens, which is the perfect space for refreshments, a drinks reception and networking. The Club Room offers a wow factor to any event, with exotic rugs and leather Chesterfields adding a classic touch to the design. 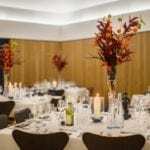 Gala dinner or buffet dining is available in three second-floor private dining rooms with panoramic views over Oxford’s dreaming spires. Gala dinner or buffet dining is available in three second-floor private dining rooms with panoramic views over Oxford’s dreaming spires. Alternatively a working lunch option is available in classrooms and seminar rooms. The three Harvard-style lecture theatres offer fantastic acoustics with fixed seating and individual desks for 76 delegates in a horseshoe shape, and are equipped with built-in translation booth services as well as individual power points on each desk for multiple electronic devices. All lecture theatres have a full range of IT/AV facilities. 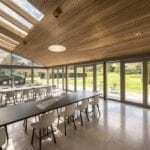 Our three flexible classrooms offer the perfect environment for conferences, meetings, exhibitions and training events. They are all located within close proximity to the Club Room, and can be arranged to suit your specific requirements. • Classroom 1 has a unique and eye-catching skylight, whilst both Classroom 2 and Classroom 3 offer stunning views over the beautiful garden via floor to ceiling windows. • Classroom 2 can seat up to 135 delegates theatre-style, whilst Classroom 1 and Classroom 3 can both seat up to 84 delegates theatre style. There are three floors of seminar rooms, with each floor having six rooms seating up to eight delegates. One floor of rooms has seating for up to 14 delegates. 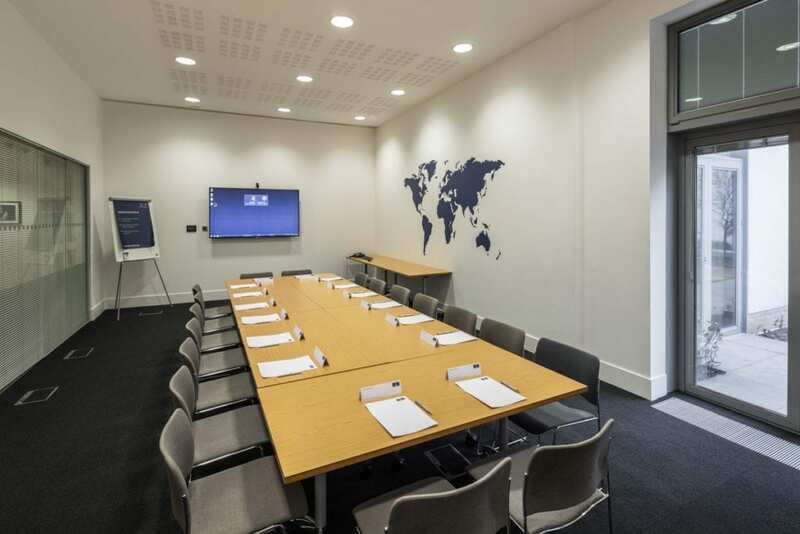 The seminar rooms are of an executive standard, perfect for boardroom meetings, or alternatively they are ideal as breakout rooms for the classrooms and lecture theatres. 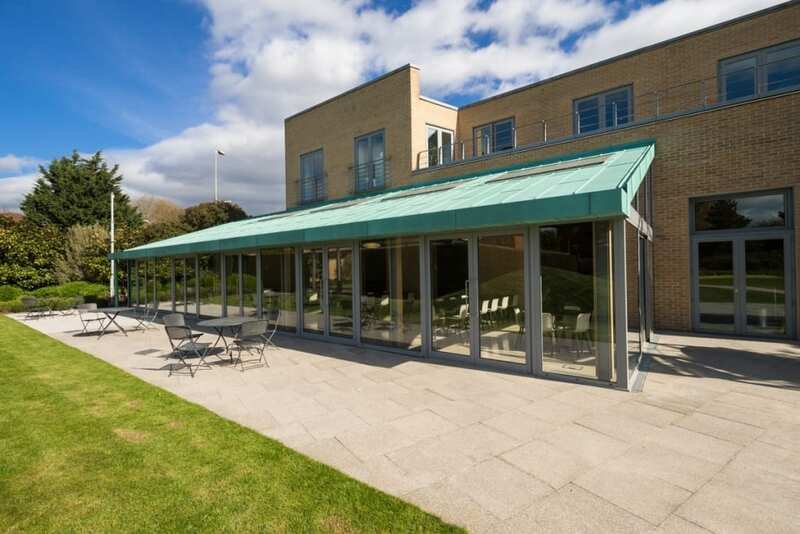 The top floor seminar rooms have access to a balcony offering fantastic countryside views. The West Wing has great environmental credentials with geothermal energy used for heating and cooling, rainwater harvesting used to flush toilets, and solar energy contributing to water heating. In addition, a green roof covers 50% of the roof area, which aids biodiversity. 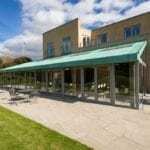 The East Wing offers a high quality venue, with the pretty courtyard and beautiful gardens ensuring an air of calm and tranquility to a wide variety of facilities. The grounds are suited to seasonal networking events such as BBQs and wine tasting, and can incorporate activities such as team building exercises. Marquees can be erected in the courtyard area. Whether you are simply looking for a meeting room or wish to arrange a large event for up to 1,000 delegates, we’ll make sure everything is perfect. The East Wing includes a 317 seat auditorium, five Harvard-style lecture theatres, two large classrooms and a wide selection of seminar rooms. 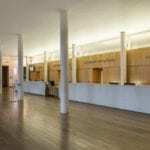 The impressive entrance hall offers a flexible space for registration, exhibitions and catering, whilst the 400 seat outdoor amphitheatre offers a truly stunning and unique option for an event. The large and medium seminar rooms all contain a desktop computer for use during your event. Our Large entrance hall can be used for many purposes such as registration, catering, networking events, drinks reception and exhibitions. The space will allow up to 10 exhibitors (1.5 metres per stand). Opened by Nelson Mandela in 2002, this impressive auditorium seats 300 delegates in tiered rows with fixed seating and desks facing a raised stage. It is fully air conditioned and offers a comprehensive range of audio visual equipment. We have two 120 capacity and two 80 capacity lecture theatres which are fully air conditioned with excellent acoustics. They have fixed seating and desks in a horseshoe shape. These are large rooms with no fixed furniture which means they can be arranged to suit your specific requirements. 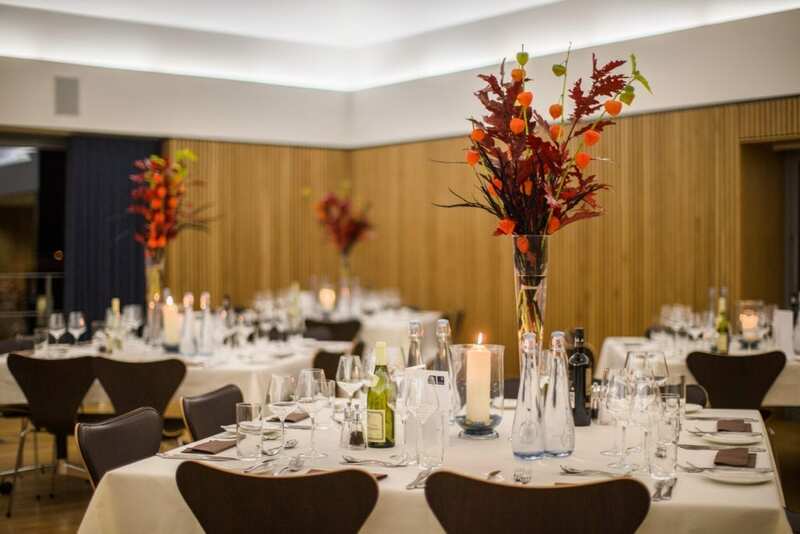 These rooms can also be used as large dining spaces for a cold buffet selection and/or for drinks receptions. The Andrew Cormack seats 20 people and is best suited for boardroom style meetings. Seminar rooms 13 and 14 each seat 22 and 16 people respectively around a fixed boardroom table. We have 12 small seminar rooms and four interview rooms. The seminar rooms each seat between eight to ten people and have doors leading out onto the courtyard. The interview rooms, which can be hired out as suite, seat up to four people. Seats 317 delegates in tiered rows with fixed seating and desks facing a raised stage. A large dining space with a pyramid-shaped sky light that creates a light and airy ambience. Can be used as a private dining area or a working lunch venue. Extremely light space with floor-to-ceiling windows and views of the garden. Built-in projector and screen and stylish furniture. Flexible flat spaced classrooms Ideal for conferences, meetings, exhibitions and training events. The Andrew Cormack seats 20 people and is best suited for boardroom-style meetings. A 400-seat stunning outdoor rooftop theatre.